Rewards up to the amount shown will be paid by the Government of South Australia, at the discretion of the Commissioner of Police, to anyone who provides information leading to the apprehension/conviction of the person or people responsible for the disappearance and suspected murder and/or leading to the location and recovery of the victim’s remains. On 5 June 1998, Annabel Strzelecki (28 years) met with friends at her residence in Clare. She has not been seen by them since. Mrs Strzelecki’s husband states she left the house late on the night of 5 June 1998 in company with two friends after a confrontation with him. Mrs Strzelecki disappeared under suspicious circumstances and police suspect she has been murdered. Suspicion surrounds her husband who died in 2000. Further information is sought in this matter, including information that would lead to the recovery of Mrs Strzelecki’s remains. Annabel Sabellano Strzelecki’s husband says he has not seen his wife since she left home in the early hours of June 6, 1998 supposedly in the company of a Filipina and a man who he had not met before that night. The couple had lived in the Clare, South Australia area since 1989. They married in the Philippines when she was 19 and Jim Strzelecki, a former opal miner, was 63. Major Crime Detective Inspector John Peake said the missing woman’s disappearance was out of character. "The fact she has still not yet been discovered tends to show that she could have met with foul play. But that’s not to say she isn’t out there alive and well and doesn’t want to be discovered." Annabel’s friends say she was totally devoted to her two children, Rachel 5, and Richard 7, and she would not have left the marriage without taking them with her. The children are being cared for by relatives in Adelaide. Reporter Penelope Debelle in The Age described the church service organised by Annabel’s friends thus: "At the service of remembrance at the Clare Uniting Church, a purple cloth was draped from the cross and on to this women pinned large black tears. "One black tear we weep upon the cloth of sorrow. One black tear for all those women who have come to this land dreaming of a better life, only to find a nightmare. "Filipino women from all over the district came to the service. The cultural bonds are strong and the Reverend Tony Eldridge says the women support each other." "She was very gentle and a good mum," said a close friend. "She was a very generous person. She didn’t have a lot, but what she did have she always wanted to share." 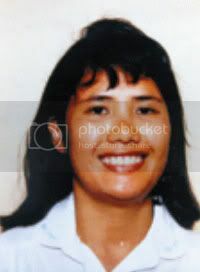 According to data collected by the Centre for Philippine Concerns–Australia (CPCA), Annabel is one of six Filipinas gone "missing" in Australia since 1980. We still do not know the whereabouts of Azucena "Asing" Pollard who in 1987 was reported by her husband, Harry, to have run away from their home in Tumbarumba, NSW taking their baby son with her. Nenita Evans of Melbourne, Victoria also disappeared in 1987 and Jean Angela Keir of NSW was last seen in February 1988. The police investigated the possible link between Jean’s disappearance and the violent death in 1991 of Rosalina Keir, the second Filipina wife of Thomas Keir. Due to lack of evidence, he was acquitted of Rosalina’s murder and no evidence of Jean’s situation came to light. CPCA data lists Rosalina Keir as one of sixteen Filipino women murdered in Australia since 1980 in whose cases the perpetrator or suspect was their non–Filipino spouse, de facto partner, fiance, boyfriend or employer. Three children were also killed. Many thanks to the author and I'd encourage you to read the whole piece. Annabel Sabellano Strzelecki was born in 1969 in the Philippines. She was the youngest child in a large and impoverished family. Annabel met Wlodzimierz .Jim. Strzelecki through a newspaper advertisement. Her friends said Jim was also writing to several other Filipino women. They married in the Philippines in 1989. Annabel was nineteen, and Jim Strzelecki was sixty-three. They had two children. On June 6, 1998, Annabel Strzelecki disappeared from her home in Clare, South Australia. She was twenty-eight years old. Jim told the police four different stories about Annabel.s disappearance. During the weekend of June 17-18, 2000, Jim Strzelecki committed suicide. Police investigations into Annabel Strzelecki.s case continue (see KASAMA 2000; Hunt 1999). the representation of Annabel Strzelecki as a .Filipino bride,. her portrayal as a devoted mother, and shifting images of Jim Strzelecki and their marital relationship, depending on whether his perspective or that of Annabel.s friends was presented. to her children.and I don.t believe she would consider taking them away..
Annabel Strzelecki, a Filipino bride . disappeared three months ago . Annabel Sabellano came to Australia in 1989 to marry Jim Strzelecki . Debelle (1998) is describing relations of abuse. However, like Haran (1998), she stops short of actually naming Strzelecki.s behavior as domestic violence. Although Haran (1998), Debelle (1998), and Pudney (2000) portray Annabel Strzelecki as a .Filipino bride,. they also undermine the notion. All three refer to the length of her marriage. Annabel was not a newly married woman or a woman about to marry, whom we commonly refer to as brides. She had been married for nine years and can hardly be called a bride. The reporting here raises several questions. First, when does a Filipina cease to be a bride? Other women in similar situations are not described in the same way, and after marriage men are not referred to as grooms. Second, why do journalists persist in labeling Filipino women as brides when they do not fit the description? Third, how does a single event come to define a woman.s entire existence? Annabel.s life had a richness and significance beyond meeting her husband through an advertisement, a form of what is popularly called the .mail-order bride. trade. The term stigmatizes Filipino women, and the women themselves find the word offensive. Moreover, there is no corresponding term for the men who meet Filipino women through introduction agencies and advertisements. Journalists did not label Jim Strzelecki a .mail-order groom..
Olive and Charles shared Annabel.s story with me. They were the first people to meet Annabel when she arrived in Clare, and they helped her adjust to life in a new country. The three became good friends. Given their close relationship, journalists sought to interview Olive and Charles about Annabel.s disappearance. One of the most glaring aspects of Annabel.s relationship with Jim Strzelecki was the forty-four-year age difference. The age disparity was a key feature of the media reportage. A situation in which a sixty-threeyear- old man can go to the Philippines and marry a nineteen-year-old woman indicates profound power inequalities of sexism, racism, and class. To understand why Annabel married Jim, it is necessary to grasp the hardship of her life in an impoverished peasant family in rural Philippines and how a .kind. foreign man promised her a better life. Annabel desired the happiness she thought would come from establishing her own family away from the insecurities of her daily life. let her go initially but she had to leave the two children behind. This is . Annabel Strzelecki.s stand against her husband was unsuccessful. She disappeared before she could take her children back to see their relations in the Philippines. die, but these are the things he used to say. Olive: Yeah, because she asked permission to go out. And he said okay. bit more to life than what she.d been putting up with . freedom to choose. Never gave her freedom to decide for her children.